Endurance and style are perhaps the most important qualities of wedding bands. When picking out one for yourself, it is essential to choose the best material for your lifestyle and taste. Research can be a lengthy process, and when you’re planning a wedding, you won’t have an abundance of time. Use this list of popular men’s wedding band materials to help narrow your search. This metal is well-known for being incredibly strong. If you do hard labor or work with your hands frequently, titanium will stand up to the demands of your day-to-day life. It is scratch-resistant, hypoallergenic, and lightweight, making it a prime choice for many grooms. Comparable to a loving relationship, Damascus steel is a mixture of two stainless steels that become stronger when united. 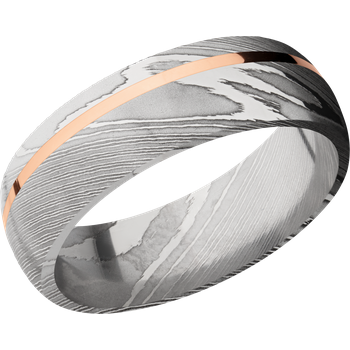 The process of their formation makes unique patterns across the band, resulting in one-of-a-kind designs no other metals can mimic. These rings resist rusting and tarnishing over time as well. Even harder than titanium, tungsten is tough and durable. This is another material for those who are more hands-on. Keep in mind that it is a bit heavier than some of your other options. Its polished silver sheen is resistant to tarnishing and looks great with laser engravings, imprints, and inlays. Due to its rarity, durability, low maintenance requirements, and attractive appearance, platinum is a top choice for wedding bands. It is perhaps the hardest wedding band material you’ll find, and the sleek, silver-white shine will never fade. As one of the pricier options, it is a lifetime investment that is sure to last. Zirconium is a great material for alternate styles. This metal has a sophisticated deep black appearance with the same weight, strength, and hypoallergenic qualities of titanium. For an additional unique touch, add wood inlays, intricate laser engravings, and colorful recessed patterns. Find the wedding bands that will stand the test of time at Clayton Jeweler. Serving the St. Louis County, MO, area, this jewelry store crafts the finest quality pieces for all budgets. Work with their experienced jewelers to design your own custom engagement rings and wedding bands, or choose from their designer brands. From jewelry repair to personalized engraving, they offer all of the jewelry services you could need. Call (314) 726-2220 to talk to a friendly staff member about their customization options. Browse their men’s wedding band selection online.